"Because there's something I've been putting off for a long time." A superhero's identity if the most important power any superhero has. It's crucial in protecting their loved ones and allowing them to live a part of their life outside the public eye. Still, an identity doesn't stop those around heroes from finding it out and it's what those who discover the secret do with the knowledge that defines them. The Imposter #! from 21 Pulp offers an amplified take on discovering a secret identity. The issue is written by James Patrick, illustrated by Martin Symanski, colored by Osmarco Valladao and lettered by ET Dollman. The Centipede is Black City’s crime vigilante. Captain Apex is Earth’s cosmic defender. Dr. Oculus is a sorcerer who fights demons from other realms. And Jungle Jack is the hero of the Wild Lands. All four of them are connected by a dangerous secret that could destroy the world and Hale Barker just learned what it is. 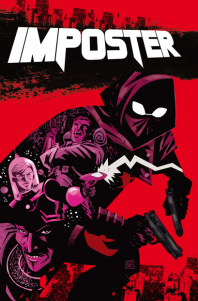 The Imposter #1 has a lot going on in it--in fact, it's pretty overwhelming at times, requiring probably a couple of reads to actually comprehend all that's going on. Having said that, Patrick does a remarkable job of tying it all together and making it feel as cohesive as possible. There's a lot of time-jumping throughout the issue and Patrick handily includes reference text that keeps the reader up to speed. All of that jumping serves as the crux of the issue's big secret, which actually pretty refreshing once Patrick tips his hand to what it is. Patrick's dialogue is very efficient at moving the story and characters to where he wants them to be. And what makes the book feel even better is how Patrick successfully blends together atmospheres in a way that pays homage to other superheroes in comics. Accompanying the rapidly jumping story is artwork by Symanski. His work is rough around the edges in a positive way, as it lends to the gritty feeling that pervades the entire issue. The characters all have a style that's unique to the relative location that Symanski is illustrating for that part of the story and he gets the chance to really show off some range. What's interesting is how Symanski frames the characters in each panel in a way that makes them stand out as who the reader should be paying particular attention to. There's also an interesting effect with the blank gutters in that there's a bold outline that shifts and changes based on the action on the page. The Imposter #1 takes the concept of a superhero's identity and blasts it. Hale Baker knows the secret of a string of heroes in the book and it's now on him to do something about it. Patrick's script feels a little crowded at first, but the end of the issue brings it all together. Symanski's artwork is a great match for the disparate locales that house the heroes in question. The Imposter #1 is a great first issue that attempts to shift the paradigm when it comes to superhero identities. The Imposter #1 is available now.